A small new feature has just been released, for people who upload to Instaud.io without creating an account: Permanent delete links! If you upload without being logged in, you can now copy a link to keep safe, which you can use if you want to delete your upload at a later date. You could previously delete uploads without having an account, but only if you did not close your browser between uploading and trying to delete the upload. The addition of this delete link means you could potentially delete something years later, as long as you still had that delete link. 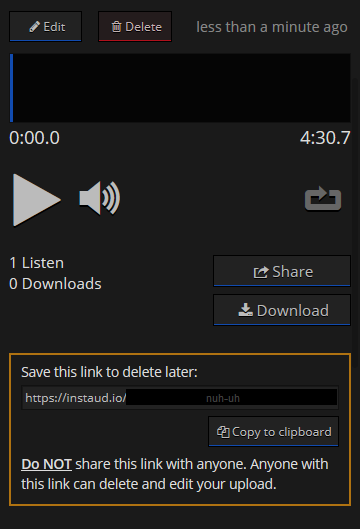 Using the delete link takes you to a confirmation page, much like you would see when clicking the delete button after you had just uploaded your audio. You can then either confirm by clicking "delete", or go back to the audio page by clicking "cancel". From there you can also go to "edit" to change anything you normally would. I hope it proves useful to some. If you'd like to show your support for Instaud.io and have a few dollars (or whatever currency) to spare, you can Buy me a Coffee. Today marks 5 years of this little website existing. I must say, I didn't anticipate it would grow as much as it has. In 2018, the site started regularly seeing days with over 1000 new uploads. That's pretty wild. If you'd like to contribute a few dollars to help cover the hosting and bandwidth costs, you can do so through Buy me a Coffee; any contribution is very much appreciated. Big thanks to those of you who already have! I've just put up a small update, which may come in rather handy for some of you "power users". If you have an account on Instaud.io, and you have more than 1 page worth of uploads, you will now see a search box at the top of Your audio. This should make it easier to find that specific thing you did 2 years ago. I've also put up a Donations page. If you'd like to help out a bit with covering Instaud.io hosting costs, now you can. It's been a good long while since I've updated anything of note on Instaud.io, but I'm pleased to release this one. From the boring end, I've entirely rewritten the code behind Instaud.io's player, which should allow for more fancy new features in the future. So there is now (do I hear a finally?) a volume control in the player. I believe it works quite fine both on desktop computers as well as on mobile browsers. Other than that, I've tweaked up the style of various bits around the site so everything is just a little bit sleeker. The audio page got some updates in addition to the player itself, namely the addition of a share button and some layout tweaks. Previously the only way to share something was to copy the URL in your browser window; now that process has been simplified. I have also removed something that had been bugging me for a long while: when clicking around on an audio track to skip around, the URL will now no longer update to indicate the position. This was the old, lazy way to share a specific point in the track. It was problematic in that you then had to click the back button many times to get back to the previous page. Now you can use the share button to share the current time instead – just make sure to tick the checkbox. Links with the old hash-based (#) time will still work. I almost forgot, but you can now also play your own uploads right on the page when you go to "Your audio" (only when logged in). Anyhow, that wraps it up for this update, I hope you enjoy the changes! I've written up an about page with some background and history about Instaud.io, providing a bit more context for new or curious visitors. EDIT: Since I personally don't use IRC anymore, the below info no longer applies. Additionally, I've started an IRC channel over on Quakenet, where you lovely people can come chat. You can either use Quakenet's webchat to get in there, or, if you have an IRC client, use this irc link: irc://irc.quakenet.org/instaudio. I have just noticed that since the server move in April, some email forwarders have been broken. This means that I have not received any requests to remove audio since that time. My sincere apologies for not getting back to you if you have emailed. If you did send any DMCA notices or requests for audio removal, please send them again. The link to do so is at the bottom of the page. You can now enable "loop" on any upload in the player, to have it repeat indefinitely. Just click or tap the loop icon in the player to turn it blue. As an uploader, you can turn looping on by default. To do this, go to "edit" on the upload, and turn on the option. Unfortunately, as you may have guessed from second screen shot, loop mode is not seamless at this time. This is due to limitations of audio playback in HTML5. I do not rule out improvements in this area in the future though. Have feedback? You can comment on the Facebook post or reply on Twitter. Update 2: Everything has been moved over, and the DNS propagated much faster than I initially anticipated. You should be able to use the site as normal again now. Thanks for your patience! Update: Everything has been moved over, and you are seeing the website on the new server. It is still in read-only mode while the DNS propagates around the world though, so everyone is getting the same version of the site. This will prevent confusion caused by people uploading new audio, linking it to their friends, and their friends not being able to view it yet. I will be moving over the website to an all new server today. During that, the site will be in read-only mode. This means that you will still be able to listen to everything already on the site, but you won't be able to upload anything new, nor change or delete it. Sign-ups will also be disabled. Read-only mode should not last longer than 24 hours. If you are still seeing read-only mode after that, try hard-refreshing the page (Ctrl/cmd+F5 or Ctrl/cmd + R). If that still doesn't work, refer to this guide on how to flush your DNS cache. In order to move the site, I need to duplicate the database. If the site weren't read-only during the move, the database on the new server would be out of sync with the old one, causing terrible conflicts and lost data. Up until now, new features and changes have only been announced on Instaudio's social channels (Facebook and Twitter), while they've simply shown up on the website without any documentation. This blog and announcement system aims to solve that. It can also act as a platform for me to talk about some background things to do with Instaudio, if you're into that sort of thing. New features and other important announcements will show up as this one does at the top of the site, for 7 days after posting. In other news, as you have likely already noticed, Instaudio now comes with spectrograms as the backdrop for the progress bar. These provide an interesting visualization of the audio frequencies in your upload. I find that they provide a more interesting picture than waveforms. You can listen to this to see the sound correspond to the image here: "Spectro". Be warned though, the high pitch noises aren't pleasant, so keep your volume down. You can learn more about spectrograms on Wikipedia. These spectrograms only show up for uploads after this feature was added, for now. It would be quite expensive (both in terms of money and in processor time) to generate spectrograms for all existing audio. 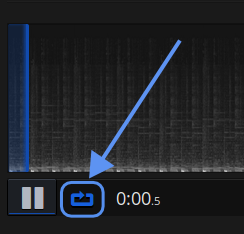 When you upload your audio, the spectrogram will not show up immediately; it is being generated in the background, and will show up when you reload the page after (usually) around 30 seconds. I chose to generate the spectrograms in the background to keep the upload process as speedy as you're used to. Anyway, I hope you enjoy the new features!